In our household, the debate on how or where to hang a hook is huge. No one wants to put a hole in a wall and regret it. Repairing that small little hole requires filler, sanding, and paint. One mistaken tap of the hammer created an hour of repairs. Luckily, there is a better way. Geckotech Reusable hooks skip the holes. These reusable hooks are made using revolutionary, MicroSuction synthetic rubber technology. In simple terms, these hooks can be used again and again. No holes, additional tape, or hooks are needed. Just place the hook on a clean surface and it is ready for use. This type of hook works on painted surfaces, glass, laminate, stainless steel, tile and much more. While this product has numerous possible uses, our favorite use is for sports medals and ribbons. With a 5 pound weight use, the kids can add an entire season's worth of awards. More importantly the kids can move their swag around the room without me adding holes to the wall. From the right side of the window to beside the closet, the ribbons get moved and I don't get mad. 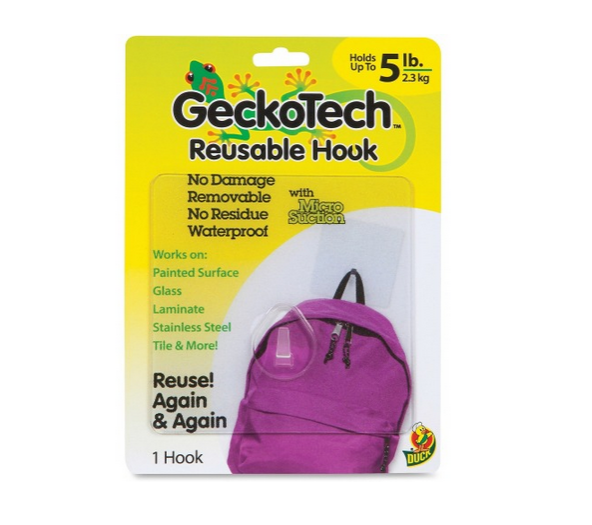 The GeckoTech reusable hooks are one of many products in the company's line. Other items like packaging tape is a often used item for many families. All of these items and other office supplies can be found at Shoplet.com. Disclosure: The reviewer received this item for purposes of this review. All opinions are her own.